I've just uploaded a new episode of the Casino News Show (http://www.casino-news-show.tv/), my video blog. This episode has an update on the Mega Moolah jackpot, a report on the World Series of Slots, and a new 3D casino game. The free webcast hosted by yours truly, the Gamblogger, gives regular updates on progressive jackpots, tournaments and new games. The site includes live jackpot tickers from all the major online casino progressive jackpots including the Mega Moolah, Beach Life, Millionaires Club, Midlife Crisis and Shopping Spree. Each episode of the free webcast includes an update on the biggest online casino progressive jackpots and lets players know where to go to try their luck at winning them. Tournaments are a great way for players to get a chance at big prizes without wagering a lot of cash, so each episode of Casino News Show includes news about upcoming slot machine and blackjack tournaments as well as stories about recent big winners. The program also introduces viewers to new games being launched at popular casinos. The Mega Moolah jackpot is over $4.3 million. A lot of people are wondering if it’s about to blow, or if it’s going to break it’s own record of $5.5 million. There’s a couple of other progressive jackpots approaching a million dollars and a bunch that are just plain overdue for a big win! Last episode I showed everyone a new Blackjack game that has a built in card counter. In this episode it’s a new slot machine at a new 3D casino. One thing I’ve learned is that there are two things online casino players want to know: where’s a big jackpot ready to be hit? And where’s a good tournament to play in? Most are pretty loyal to their favourite casino or game, but they seem to like to hear about new games to try as well. The program uses special technology so you can just click on the video screen when you see something you’d like to know more about. For instance, if you want to try your luck at any of the jackpots or new games described in the program you can simply click on your video screen to be taken to the casino where you can play them. 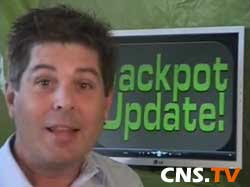 My brief regular update on tournaments, games, winners and jackpots is free to view at Casino-News-Show.TV.